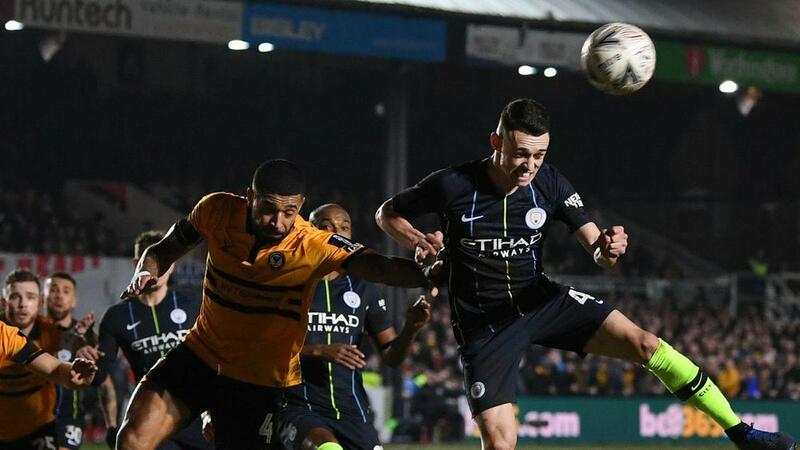 Phil Foden netted an impressive FA Cup brace in Manchester City's 4-1 fifth-round win at Newport County despite a Rodney Parade pitch he branded the worst he has played on. Pep Guardiola's free-scoring Premier League leaders were kept at bay during a keenly contested first half before Leroy Sane broke the deadlock six minutes into the second period. Foden dispatched a fine solo effort in the 75th minute but the 18-year-old's fifth goal of the season was required to settle nerves a minute from time after Newport striker Padraig Amond reduced the arrears. "We showed our professionalism, keeping the ball moving. In the end it showed," the England Under-21 international told BT Sport. "We scored straight away after [Amond] scored, it's always good to do that. "[The pitch] is the worst I've played on, to be honest."